Back in the early eighties I was in highschool and avidly followed all things aviation. At the time, Canada was busy trying to select a new fighter jet for its' Armed Forces. 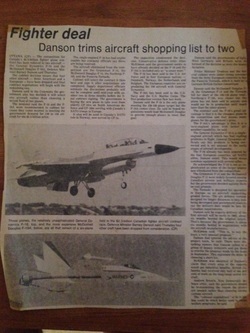 Like the aviation geek I was, I collected all the newspaper articles on the subject and recently uncovered a cache of articles that somehow didn't make it to the trash. One of the articles is from around 1983 and the competition which had started with around six aircraft had been narrowed down to two fighters; the single engine F-16 (still in service with the US Forces today), and the twin engine Hornet (also still in service with the US airforce to this day). At stake was a 2.3 billion dollar contract for 150 aircraft- an astronomical amount at the time which generated alot of discussion about how much Canada should pay for it's airforce. Because Canada wanted an all-weather fighter that could cover vast distances with redundant safety, the F-18 ultimately won, largely due to the fact that the twin engines were perceived as a safer more reliable option than a single engine fighter. Both fighter manufacturers relied on proven jet engine models so there were no misgivings about reliability of either platform- these were both dependable aircraft. Why is it that suddenly, two engines versus one (on an unproven F-35 engine) when flying over Canada's north, no longer requires any consideration? The last time I checked, most companies are still building twin engine jet fighters so there must be some advantage. At 2.3 billion for the contract, that equates to 2 million dollars per plane. The current F-35 models rolling off the production line at Forth Worth cost something like 115 million each. Let's put that number in perspective with something most people can relate to- a family car. In 1983 the average price of a new car was $10,640 and in 2014, the average price is $32,000. So, in 30 years car prices have increased three-fold. Let's say that high tech defense hardware increases a little faster, say, four fold over thirty years- that would still put the anticipated cost of a brand new fighter somewhere around 8 million dollars per plane. That's a huge disparity between the 115 million dollar cost of an F-35 and a 55 million dollar F-18. But what if my comparison is invalid and fighter jets simply just cost more? I think we should really ask why would we not pay to get two fighters for the price of one when the F-18 seems to satisfactorily be meeting the combat readiness requirements of the American airforce-after all, they are buying the next generation of this fighter. Let me try another argument since proponents like to talk about the cost of the F-35 not in absolute terms like you would expect to negotiate at a car lot, but by some theoretical life-time cost which is further muddied by unmeasurable variables such as how many of the aircraft are built. Are you kidding me? Who would ever buy a car from a dealership that tells you the car price is based on the estimated service costs you'll incur over the car's expected lifespan or how many models ultimately roll off the production line- the last I checked we were planning on buying these aircraft, not leasing them. But ok, if that's the logic to be used, then let's apply the same methodology to extraneous costs such as inadvertent airshow crashes and pilot training mishaps. By my research ( which might be a little off), Canada is down to 103 F-18s from the 150 we started with. Assuming we lose a comparable number of aircraft over thirty years of the F-35, that would be 5 billion four hundred million in lost aircraft over the same period of future operation. Part of the reason my parents always bought a reasonably priced car was because they couldn't afford to replace the Lamborghini if their teenage son ever had a fender bender of any consequence. There's three versions of the F-35 but all three were built around the idea of making just one of the versions into an American version of the Harrier jump jet which can land and take-off vertically. This model comprises about 15% of the three variants with the other two not having this capability. The idea was to save on cost by designing three aircraft into one airplane. The problem is that no designer would design the two other variants as they now appear were it not for the fact that the jump jet version required a massive airframe to build the VTOL systems into. As a result, the two designs which form 85% of the aircraft to be built, are big, overweight, lumbering planes that are twice as heavy as their modern counterparts. In an age where Americans can no longer spend recklessly on defence procurement as they once did when I was a kid, (heck, the government doesn't even have the money to launch their own rockets anymore) the idea of making one aircraft design for three different roles is easily understood but any aircraft designer will tell you that the more roles you give to any aircraft design, the more sacrifices you will have to make. That's why cargo planes don't make great fighters.